WSU Kitsap Master Gardener Learning Gardens serve as a model for gardening techniques and various plants, both edible and ornamental, that are appropriate to our area. The learning gardens provide a special setting for educating Kitsap County residents about landscape management practices that reduce impacts on land and water resources and edible gardening techniques that are successful for growing nutritious produce at home. Suppression of weeds via: weed barrier materials, hand pulling, mulches. WSU Kitsap demonstration gardens are maintained using only materials labeled for organic use; no synthetic fertilizers, insecticides or herbicides are used in an effort to have less impact on our land and water resources. The gardens are lovingly planned and tended by trained WSU Kitsap Master Gardeners who assist the community with their horticulture questions. Click on the garden links to see the current schedule of when Master Gardeners are present at each of the learning gardens: Our volunteers can only provide information to home gardeners. Commercial farmers and businesses need to contact WSU Kitsap Extension office for help, 360-337-7157 x6262. 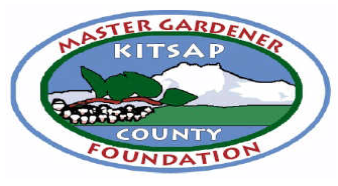 The WSU Kitsap Master Gardener Plant Diagnostic Clinics are made possible by the generous support of the Master Gardener Foundation of Kitsap County. To learn more or join, visit the Foundation’s website at www.kitsapgardens.org. So you want to start a garden?